I couldn’t pass up the cute little round zucchinis at the farmer’s market and knew right away that I wanted to hollow them out and stuff them with something yummy. 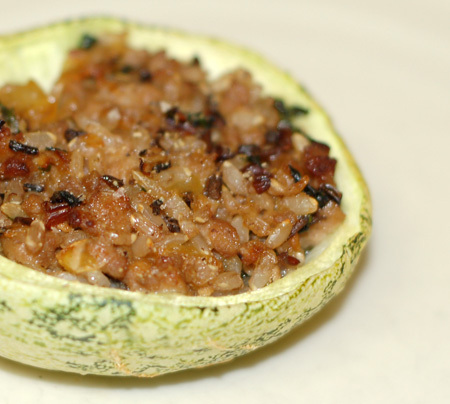 The standard stuffing for zucchini (and other vegetables such as onions and peppers as well) is an Italian-inspired blend of ground beef, rice and veggies, but I wanted to go in a completely different direction. I had boneless pork country ribs and basil in the fridge, so I ended up making a filling inspired by a Thai stir-fry with pork and basil, which is served over rice and often topped with a fried egg. After grinding up about a pound and a half of the boneless ribs (and stashing two-thirds of it away in the freezer for future use, likely potstickers or breakfast sausage), I set about preparing the zucchinis. All the recipes I saw called for scooping out the zucchinis’ innards with a melon baller or grapefruit spoon, neither of which I own. I decided that the best approach was to use an ice cream scoop instead; it worked out perfectly for the size of zucchinis that I had. 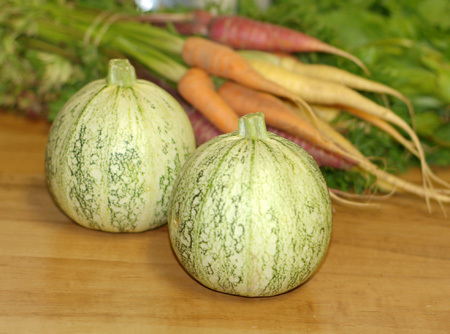 I also decided to trim the zukes and split them from stem to stern rather than across the equator. I’ve seen some cute stuffed zucchinis that almost looked like mini jack-o-lanterns with their tops jauntily reapplied over the filling, but I was more concerned with ease of eating than presentation, truth be told. The emptied shells were cooked briefly in the microwave to help soften them up before stuffing. For my filling, I first got some rice simmering, a blend of grains from Ankeny Lakes Wild Rice Company, which is a local producer located just outside Salem. Then I sauteed shallots, garlic and a handful of diced zucchini guts, and added the ground pork to brown up. Finally, I seasoned the pork mixture with ginger, soy, fish sauce and a touch of sugar, stirred in a pile of chopped basil and the rice, and loaded the lot into my parcooked zucchini shells. 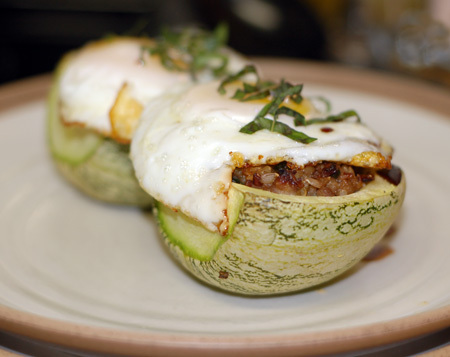 They cooked until the zucchini was tender-crisp and the filling was starting to crisp up on top. I decided at the last moment to fry some eggs to add a finishing touch to my Thai-inspired meal. These were sunny-side up eggs, cooked over medium high heat in a puddle of oil; I basted the tops of the eggs with the hot oil until the whites were just set. This method produces a fried egg with a runny yolk and crispy browned edges. As soon as each egg went down, I drizzled the top with a splash of soy sauce for seasoning and finished with some shreds of fresh basil. The completed dish was delicious, even better than I had imagined when I sat down to compose it. The zucchini had the perfect balance of tenderness and bite. The pork and rice stuffing was deeply savory, fragrant with basil, with a touch of sweet heat in the background. The fried egg put the dish over the top, somehow making it feel more like a complete meal and not merely a side dish. It wasn’t especially easy to eat as a single unit, since the round zucchini wanted to roll around on the plate as we cut into it, but each hard-earned bite was perfectly balanced. I would make this dish again, with or without the zucchini shell. The traditional version of the pork stir-fry is much spicier than I have made it here, so you could easily up the chile heat if that appeals to you. Preheat oven to 375 F. Cut stem and flower ends evenly off the zucchini, trimming as little as possible. 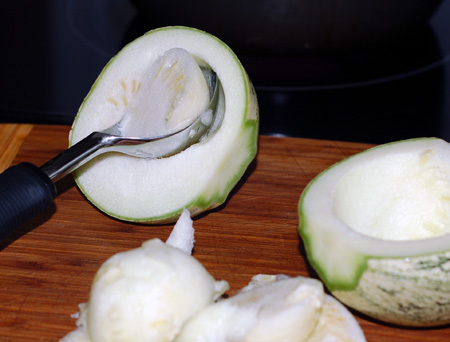 Cut zucchini in half lengthwise, then scoop out and discard most of the zucchini flesh and seeds using a melon baller or ice cream scoop, leaving an even 1/2 inch of flesh attached to the skin. If your zucchini are rolling around a lot, you can cut a thin slice on the bottom side of each to make them sit up. Microwave zucchini 3-4 minutes on high. Heat a splash of oil in a skillet over medium heat; add the shallot and garlic, and cook for a few minutes, until tender and fragrant. Meanwhile, chop about half a cup of the zucchini innards into small dice; add this to the shallot mixture with a pinch of salt, and cook until tender. Dump in the ground pork and break it up with your spoon; add the ginger and stir-fry until the pork is cooked through. Stir in the soy sauce, fish sauce and sugar; remove from the heat and add the basil and cooked rice. Place the softened zucchini shells in a small oiled casserole dish; season with salt and pepper. Divide the filling between the shells, packing it in firmly. Bake for 20-30 minutes, until the zucchini is tender-crisp and the stuffing is hot and beginning to crisp slightly on top. 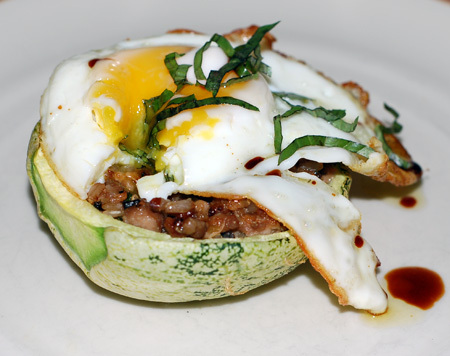 When the zucchini is nearly done, pour 1/3 C oil into a large nonstick skillet over medium high heat, and add the eggs. Cook until the whites are starting to brown and crisp up around the edges, carefully using a spoon to baste the tops of the eggs with the hot oil until the whites are set. To serve, place 2 zucchini halves on each plate, top with an egg, drizzle with a few drops of soy sauce and sprinkle with some basil chiffonade. Serves 2-3. Source: Adapted from Kalyn’s Kitchen and Tan Kitchen.